This month, CTU made a major step in the fight against gentrification in our community! On October 18th, the Land Use Committee of Community Board 3 voted unanimously to co-sponsor our application to rezone the Two Bridges waterfront area near Chinatown. This is an important step forward towards long-term protections for tenants and small businesses in our neighborhood. 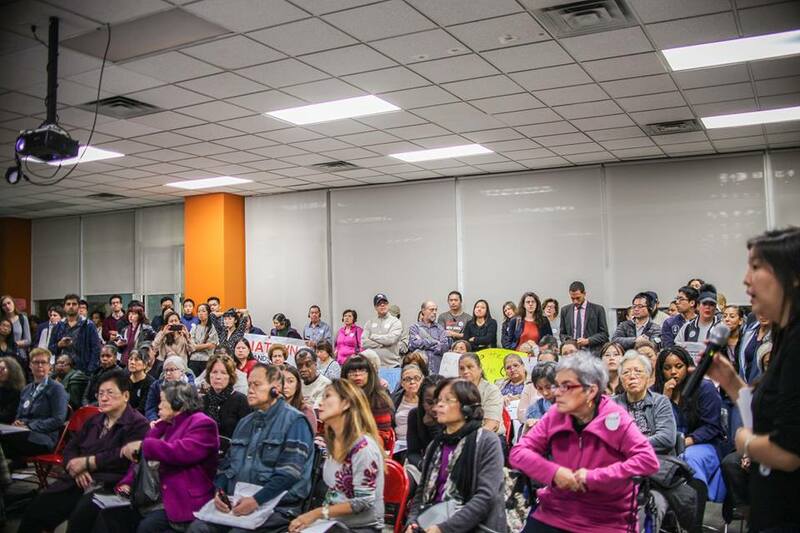 While we are pushing for the entire Chinatown Working Group (CWG) plan to pass, we know that multi-millionaire developers and our pro-wealthy housing market are trying to expedite a process to develop their proposed luxury towers. Hence, we must act quickly! New Yorkers have seen in many communities, like Williamsburg and Long Island City, that luxury development on the waterfront can send gentrification into hyperdrive. Currently, real estate developers are building an 80-story luxury residential megatower near the Manhattan Bridge. This building is more than three times the size of any other building in the area, and it replaces an affordable supermarket that many working and middle-class residents frequented. In addition, three more real estate developers have similarly sized buildings planned for a three-block stretch of the waterfront. If built without community proper protections in place, these buildings pose a tremendous threat towards working and middle-class residents. For that reason, in August of this year, we decided to work with two local groups, TUFF-LES and GOLES, on an application to rezone the waterfront near Chinatown. Our proposal is based on the Chinatown Working Group Plan’s recommendations for the area, which were the product of almost 10 years of painstaking community debate and compromise. The CWG plan recommendations would severely limit the height of luxury megatowers currently planned for the area and institute much-needed tenant protections, like anti-harassment measures and stricter review of new bars, clubs, hotels, and big box stores. We, like many others in Chinatown, believe that instituting this community-developed rezoning plan is a key step in protecting our neighborhood from gentrification. On October 18th, the Land Use Committee of Community Board 3 unanimously voted to co-sponsor our proposal during a public meeting. This meeting had well over 100 people in attendance, including many CTU members. This is a crucial step forward in the process to protect our working-class neighborhood and the people who live here. Our organizations will begin talking with the Department of City Planning this month. We are very excited to celebrate this win, and we are dedicated to the continued fight for the waterfront and for the entire Chinatown Working Group Plan!